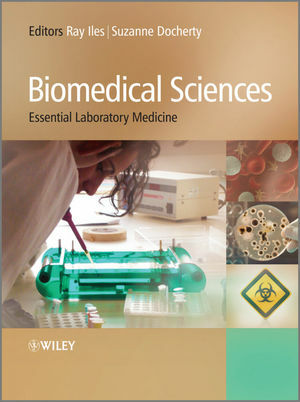 Biomedical Sciences is an indispensable, all encompassing core textbook for first/ second year biomedical science students that will support them throughout their undergraduate career. The book includes the key components of the IBMS accredited degree programmes, plus sections on actual practice in UK hospital laboratories (including the compilation of a reflective portfolio). The book is visually exciting, and written in an interesting and accessible manner while maintaining scientific rigour. Highlighted boxes within the text link the theory to actual clinical laboratory practice for example, the histopathology chapter includes a photographically illustrated flow chart of the progress of a specimen through the histopathology lab, so that students can actually see how the specimen reception/inking/cut-up/cassette/block/section/stain system works, with an emphasis on the safety procedures that ensure specimens are not confused). Professor Ray Iles and Dr Suzanne Docherty, School of Health & Social Sciences, Middlesex University, Hendon Campus, London, UK. Ray Iles has experience of writing a chapter of Kumar & Clark's Clinical Medicine (one of the market leading textbooks for medical students) and would like to provide the same kind of core textbook for biomedical science students.